This recipe will keep you warm as the days turn colder, and the local ingredients give it an extra boost of flavor! Preheat oven to 375 degrees. Mix together dry and wet ingredients separately. Stir wet ingredients into dry ingredients until just combined. Bake in a greased 9-inch pan for 20-30 minutes until a knife inserted in the center comes out clean. Prepare 4 cups cornbread crumbs from the cornbread which can be frozen until needed. Soak lima beans overnight in salted water keeping beans covered with liquid. Drain and rinse. Insert cloves into onion. Place beans into pot with salt pork cubes, carrots, onion with cloves, and bay leaf. Bring to a boil and skim and discard the surface foam. Reduce to simmer and continue cooking for 30-60 minutes or until beans are tender. Remove and discard vegetables, salt pork, and bay leaf. Refrigerate beans in their cooking liquid overnight. Liberally pepper the meat and brown in goose fat. Remove the browned meat from the pan and deglaze the pan with chicken stock. Pour in the can of tomatoes with its liquid, add the dried basil, return the browned meat to the pan, cover the pan and gently braise the pork one hour or until fork tender. Refrigerate the browned meat in the chicken stock and tomatoes overnight. Place package in refrigerator to thaw overnight. Slice the sausages into 1/2 in. slices. Place in skillet and cover with water. Heat until the water is gently bubbling and continue heating for ten minutes to render some of the fat. Place heated sausage in colander and rinse with hot water. Remove any solidified fat from the beans and the braised pork. Mix the chopped thyme, savory, chives, and the cayenne pepper into the beans and the bean liquid. Adjust salt and pepper to taste. Pick the duck meat from the bones. Put a layer of beans in a 4-quart baking dish followed by a layer of pork and duck. Alternate beans with pork and duck until completed. Carefully pour in any remaining bean or braising liquids so that the beans are covered. If more liquid is needed to cover, use up to 1 quart of chick stock. Place sausage slices on the top. Bake in 350 degree oven for on hour and fifteen minutes or until the liquid is bubbling. Monitor the liquid and carefully pour in additional chicken stock or water to keep the beans covered. When top starts browning, gently push sausage slices into liquid. 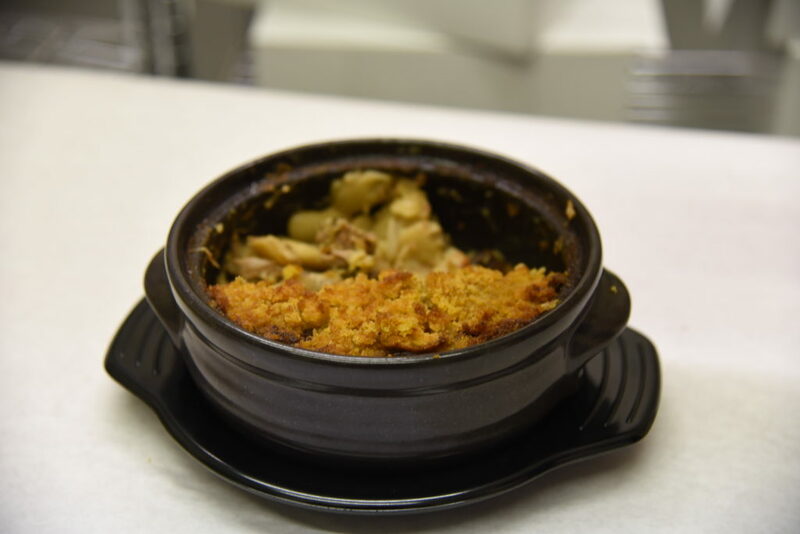 After liquid is bubbling and the top has browned, sprinkle the cornbread crumbs over the cassoulet and place back into the oven until browned, approximately another 30 minutes.